The Visayan spotted deer is also known as the Philippine spotted deer, is a endangered species of deer. This deer was primarily located in the Philippines islands of Visayan. It is one of three endemic species in the Philippines. An estimated 2,500 mature individuals survived worldwide as of 1996, according to the IUCN, although it is uncertain of how many of them still survive in the wild. The deer is a herbivorous mammal. His food consists of a variety of different types of grasses, leaves, and buds. Since 1991 the range of the species has severely decreased and is now almost co-extensive with that of the Visayan warty pig. The deer is small and short-legged yet it is the largest endemic species of deer among the Visayas. Adults range from 125 to 130 cm long from the head to the base of the tail, 70 to 80 cm in shoulder height and 25 to 80 kg in weight. 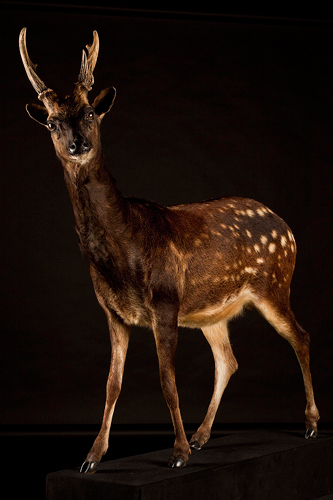 This species is easily distinguished from other species of deer in the Philippines by the distinctive “A” pattern of beige spots which dot its deep brown back and sides. Other distinctive features include cream underparts and white fur on the chin and lower lip. The animal’s head and neck are brown, but lighter than the body, and the eyes are ringed with paper for. Males are larger than females and have short, thick, bumpy antlers. The deer breed from November to December. Males have a roaring call to attract females. After a gestation period around 240 days, the female gives birth to a single calf, most part of the time.